On Friday 6 February SLEF hosted an event exploring: Do children and young people connect to nature enough? 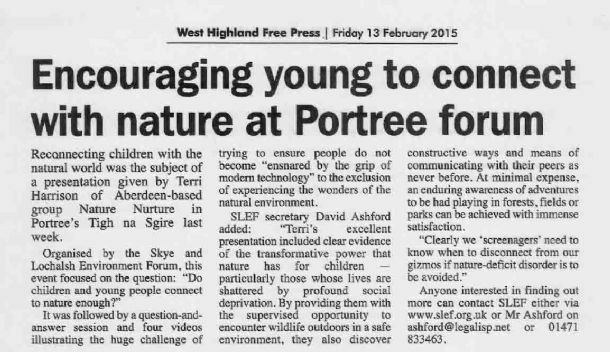 As well as wide-ranging discussion, Terri Harrison, founder of Nature Nurture gave a presentation about the transformative effect that connecting with nature has on children and young people, including how to encourage ‘screenagers’ out-of-doors. Thereafter followed a discussion about ‘Nature Deficit Disorder’ with inspirational and informative video extracts, including from the internationally acclaimed film ‘Project Wild Thing’ and from Richard Louv (author of 'The Nature Principle' & 'Last Child in the Woods'), and a chance to chat with SLEF Members.